This method allows you to enter a list of students for each group into a text box. Go to Course Setup and click on Groups. Scroll to Bulk Import / Export. Click on the following dropbox to select the class whose groups you want to manage. Click Add Groups and Members. This method allows you to create groups, change group types, remove groups and allocate students to groups, all in one CSV file. If you would like to manage existing group allocations, you can Export the current state of your group data as a starting point. To do this, click on the Export tab and continue to Step 2. Alternatively, if you would like to create new group allocations, you can download a Sample file and continue to Step 5. Choose what to use as a student identifier by clicking on the dropbox below. Choose the format of the CSV file you would like to work with, either Each row represents a student or Each row represents a group. Click Export group data to CSV to download your CSV file. Select your CSV file and click Open to upload. If the bulk allocation was successful, you will receive the following message. Export your existing group allocations using the Export tab. Make the desired changes to the exported CSV. Re-upload the CSV to apply these changes. Use the tools under the export tab to export your current group allocations. 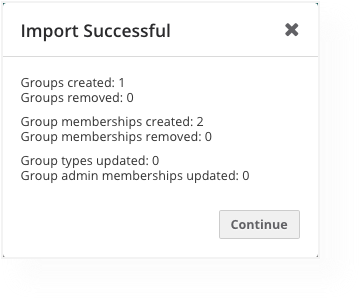 Use the tools under the import tab to apply bulk changes to your current group allocations. Want to import groups and group allocations in a brand new course? 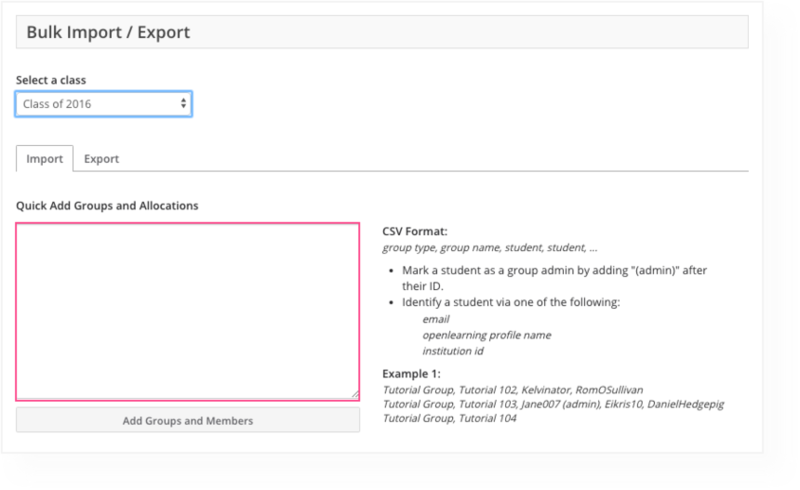 Make sure to set up group types in the course so that the group types and names from your .csv file can be automatically populated by the system.